Pico Raceway, two miles south of Rutland, Vermont, was just one of the dozens of stock car tracks that popped up in the empty spaces in the state in 1950 and 1951. Its history is short, cut off by a mountain of red ink and unpaid bills; but, while it was around in 1951 and 1952, the track attracted some of the sport’s greatest names in that region, as well as dozens of middle – level drivers and its own share of faithful local field fillers. Steady Tony Provencher [one of my neighbors] was one of those faithful Pico field fillers. Below – Henry LaVictorie was another loyal Pico driver who didn't win much. Pico was distinctly different in appearance during the two years of its operation and – it must be said emphatically – was never much like most of the other tracks of its time. Track facilities were very good in both years. The big difference in 1952 was the huge sand bank that protected the spectators from the action was bolstered by an impressive cement wall with a pipe railing on top - into which was integrated new bleachers. This is not a comprehensive history of the track. Suffice it to say the facility ran, under the ownership of Patsy Romano, Geno Franzoni, and Abe Newman, for two years. After that, two concerted efforts were made to restart the idle facility. It seemed inconceivable to racing people that a track with that level of facilities was just sitting, dormant. 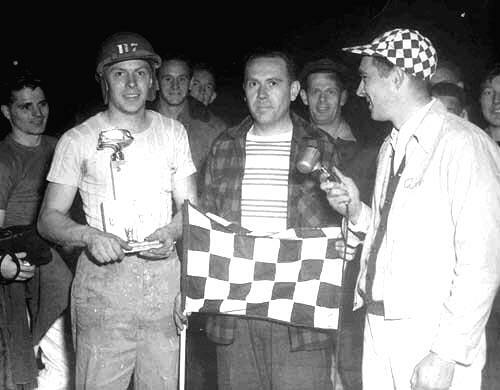 In 1954, the prestigious Tri – City Racing Association, with President Stanley Curtis, sought to have the track join up with their existing member tracks, Empire Raceway of Menands, NY and Stateline Speedway near Bennington, VT.
promoter who crossed paths with Pico, as well as a hall of fame driver who did the same. 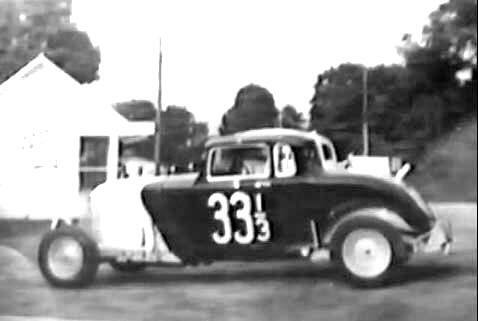 The Tri City group had a number of recognizable names in the racing world of that time: Carl Roupp [Menands], Bill Thompson [Menands], Mike Akhoury [Stateline], “Uncle Art” Stuarts [Lebanon Valley], Doug Garrison [prominent driver], and Jim Brush [Pine Bowl] to name a few. Neither the Tri City attempt in 1954 nor another attempt to reopen in 1955 worked. The 1955 re-opening managed one show, but that was the end. The track was then briefly called Green Mountain Raceway. Pico was always having to compete for cars and spectators. While racing was very disorganized and fledgling elsewhere, eastern New York, western New Hampshire, southern Vermont, and northern Massachusetts had very viable track operations, featuring a number of stars [such as Rene Charland] who would go on to big careers. The nearest problem for Pico was the older Fairmont Park Motor Speedway, about ten miles to the west in Fair Haven. The two tracks would stage a promotional battle in the Rutland Herald to reach out to potential supporters. It must be said that Pico won out, and then promptly went belly up. first in his own #80 and later in George Barber’s legendary #46 coupe. The list of drivers who appeared at the Rutland track is impressive, to say the least, containing a number of names who would be inducted into halls of fame such as New England Antique Racers, New York State Stock Car Association, the DIRT hall, in Weedsport, and others. 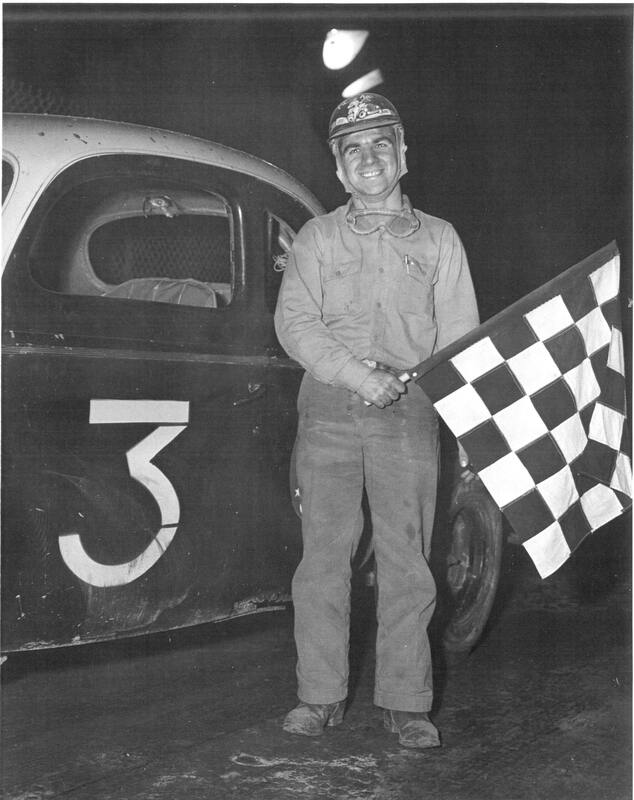 Legendary Roy “Pappy” Forsyth of Keene, NH – driving both for himself in 1951 and for the equally – legendary car owner George Barber in 1952, won races at Pico. Storied Empire State drivers such as Steve Danish, of Cropseyville; Howard “Jeep” Herbert, of Rotterdam; Ken Shoemaker, then of Whitehall; Doug Garrison, of Poughkeepsie; Pete Corey, of Cohoes; Ollie Palmer, of Westmere; and Spence Parkhurst, of Saratoga Springs were a few of these. 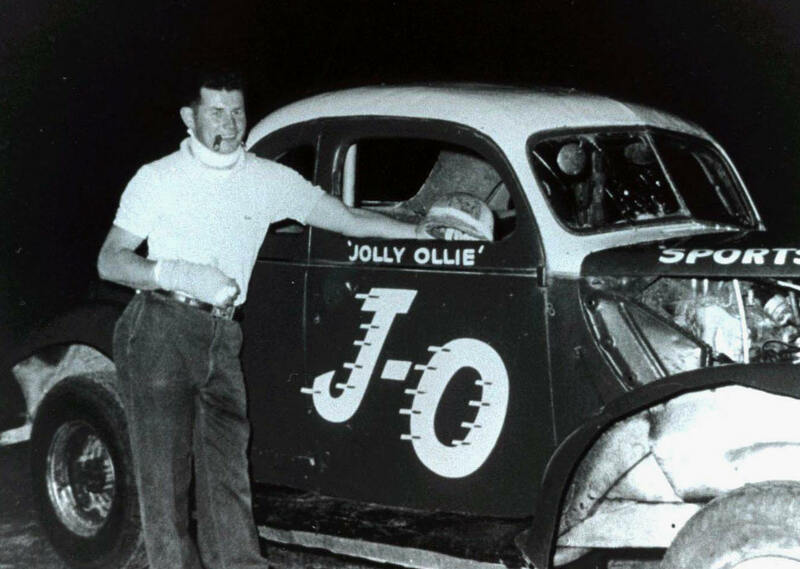 Jollie Ollie’s J-O is one of the few cars I can actually recall seeing. Below- Jeep Herbert’s Bob Mott 3NY was another. Pico shared these New York teams with tracks such as Stateline, Mettawee Speedway of Granville, NY, and tracks as far away as Rhinebeck, NY. 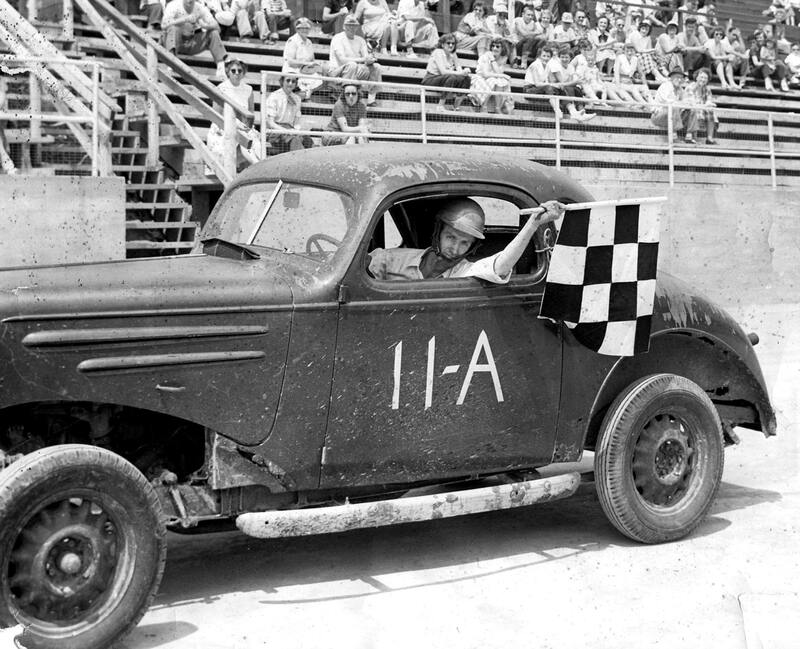 It shared the New England drivers with Brattleboro Speedway, West Brattleboro, VT; Rhythm Inn Speedway in Millers Falls, MA; the track at the Cheshire fairgrounds near Keene, NH; and [briefly] the Manchester, VT fairgrounds. It is from these tracks that Pico almost certainly hosted future four – time NASCAR National Sportsman champion, Rene Charland of Holyoke, MA. 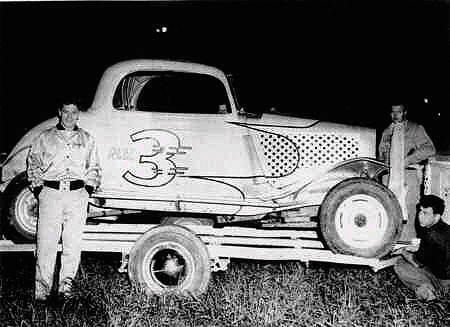 Besides Forsyth and Charland, this group also offered Sonny Rabideau, Brattleboro; Art Rousseau, from Connecticut; futue NASCAR National Modified Champion Ernie Gahan, from Dover, NH; Cecil Bosworth, Athol, MA; and Buddy Krebs, from Connecticut. Not backing down an inch from this staggering list of stars were the Vermont drivers from the area or from a ways up the highway. First, there were the Georges: George Rogers of Castleton; George Connors, Danby; and George Pritchard of Fair Haven. Manchester, Vermont sent Dave Brooks, an engine building genius, and Gene Tetrault, whose career would last up into the 1970’s. Rutland’s own Al Romano, son of one of the track owners, was a top star as was neighbor, Jerry “The Rutland Rocket” King. Pico received some visits from the competitive Chittenden County racing community in the persons of Jackie Peterson, Ronnie Farnsworth, Gordy Owen, and more. But, one of Pico’s strongest connections seemed to be with the racing scene that centered around the greater Saratoga Springs area. Not only did the track feature Spence Parkhurst, but the flagger, Chet Hames hailed from Saratoga. Parkhurst was often joined at Pico by drivers such as Jack Barney, regular at Stateline, Harold Kyer, a big name at a number of tracks, and George Baumgardner, some of whose bigger successes came when driving the Ted Vogel #95. The Saratoga bunch was spawned by a number of tracks within minutes of the spa city. To the north, there was an early track called McGregor Speedway, perhaps most famous for leading the fight against the New York State Police crackdown on auto racing [using archaic Sunday blue laws] around 1950 or 1951. Nearby, to the east, was Schuylerville’s Hudson River Speedway, owned by the Garnsey family. Not far away, near Ballston Lake, the White’s Beach Speedway would open, often a haven for those teams whose budgets would not allow them to compete at the Fonda Speedways of the world. Then, too, the White’s Beach crowd seemed to have a close relationship with the Ashland Park [or Warrensburgh Speedway] above Lake George. Towards the heyday of the earlier tracks, Pico drivers were actually appearing all the way up in Warrensburgh. Harold Kyer adjusts his helmet outside his #P61 at Stateline. 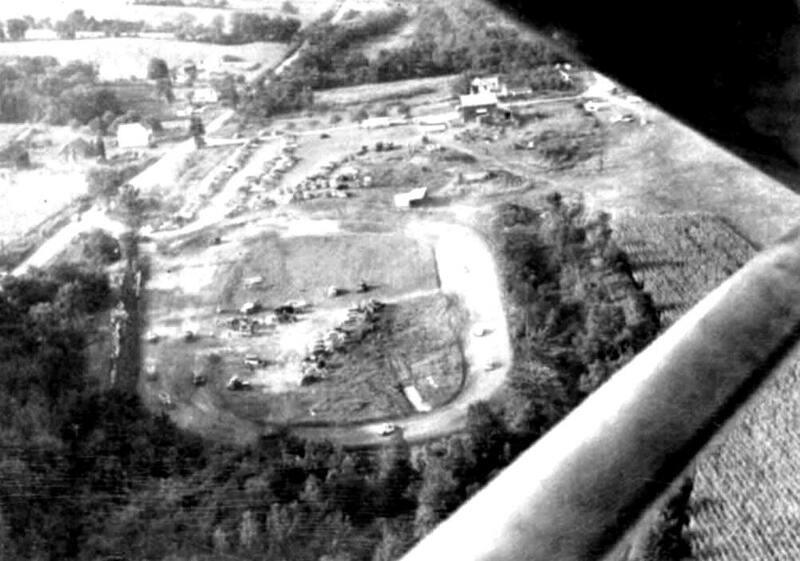 Below – An aerial shot of Garnsey’s Hudson River Speedway, taken by the track’s owner from his plane. There are few tracks from the early era, most of whom had as short a life as Pico Raceway, that can claim to have hosted so many major names. If they had one hall fo fame for the region, many of the inductees would have run at Pico. Even the team that ended up producing universal hallo of famer Lou Lazarro once arrived at the doorstep of Pico in 1951 – on what seemed to be some sort of New England tour. A maroon and white Chrysler Corporation coupe of some sort – likely 1936 – won a race at Pico in ’51. It is not clear whether the driver was Johnny Velletto or Junior Bianco; but, it is likely that Louie was with them – as yet too young to drive. That whole Italian bunch from Vinnie Maugieri’s auto repair all went to Proctor High School, in Utica. Wouldn’t they have gotten a kick out the fact that near – to – Pico Proctor [Vermont] High School used the same colors of maroon and white that made Lazarro’s cars so famous. Apparently, from what I can figure, the Utica tour de force went on to race at the new Beech Ridge Speedway in Scarborough, Maine so thereafter; and whoever was driving the car nearly tore down the entire front stretch catch fence there. The smiling Pico winner is either Johnny Velletto or Junior Bianco, from the heart of Utica, NY. This photo is known to be one of New York racing legend Link Pettit broad sliding through turn 3 at Pico in one of his first race cars. The facility was a freaking sand pit except for the sparse clay on the track. By 1956, taking a car drive around the Pico oval meant experiencing a very rough, washboardy ride. Not terribly long after the final attempts to use the nice facility, it was leveled and a General Electric plant was built on the spot, wiping out all but a portion of the backstretch and turn three. These were incorporated into the lawn in the rear. Anyone not familiar with the old track out on Windcrest Road would have no reason to believe a race track ever existed there, on what was once just Abe Newman’s farm. Anyone who attended regularly had not only seen hall of fame drivers, but the names behind the promotion were very noteworthy, as well. But, the ghosts which still race around in the wind on weekend nights – if they could talk – would tell you that they might be expecting a damned good field of cars pretty soon [and a lot them would be famous guys]. They wouldn’t be lying. This 1964 shows that the Pico oval was still there, ten years after the last race. Please email me if you have any photos to lend me or information and corrections I could benefit from. Please do not submit anything you are not willing to allow me to use on my website - and thanks. Email is: wladabou@comcast.net . For those who still don’t like computers - my regular address is: Bill Ladabouche, 23 York Street,Swanton, Vermont 05488.